The ultimate water fed glass and solar cleaning brushes have arrived. Throw away all of your other brushes for glass and solar cleaning. The Alpha Shifter brush is all you need. Shifter Brush V-jets are designed to rinse while brush is in contact with glass (do not lift off to rinse). 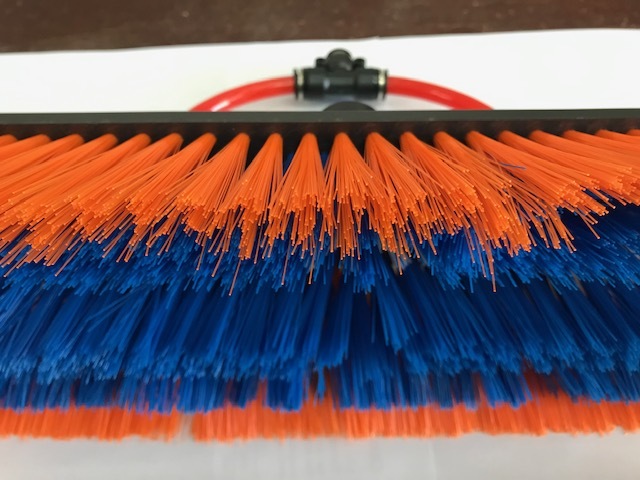 The best and easiest WFP scrubbing brush for commercial and residential, designed with high quality polyester and nylon bristles (not cheaper polypropylene). – A brush that works like a scrubbing pad, stable on glass with long goosenecks. – Water spray goes to the top of the brush without over-spraying onto frames. Threaded euro gooseneck is required.